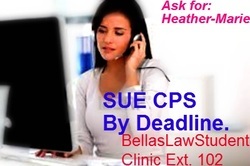 SUE CPS IN FEDERAL COURT,on FACEBOOK -popular page. Always search for a lawyer prior,to go over your case,prior to filing astutely pro-se. Student Research W.O.N.Network,are not lawyers. All LEGAL ADVICE,reach a lawyer immediate-by logging out of our powerful informative site. If your filing,pro-se, as our staff member/founder prudently and timely have done? Call ext. 102/260 and begin your Live-CHAT 1-on-1 session today. to watch those deadlines.Pro Per(Self file litigants)as our own staff member/founder has done hers correctly/timely/as her family.